As I frequently tell new knitters, a mistake is simply a new stitch. I was knitting up the traditional Ridge Rib. I didn't realize until I took the photograph that I forgot one row. Uh, oops. And hence a new stitch is born! It isn't reversible. So here we are on week two of the KAL afghan. I know it seems slow going. The knitting is actually quick. I am just slow at all the photography, graphics and typing up of instructions. If you have a burning desire to just get going, then by all means you have now 8 different stitches to try out in a variety of colors. They will look slightly different with each color. But if you are patient and have a zillion other interruptions in your life like I do, there is definitely more stitching fun to come. This stitch makes a dressy, reversible fabric. A nice option for blankets and scarves. Personally I am working it up into a vest. To learn more of how this KAL works please refer to the first post for a supply list and such. So the way this will work is each Sunday evening at 8pm I will be live streaming on Periscope as @lbostudio. Tune in to watch me. I will be answering knit questions. When you see *K1,P1* that means work the K1,P1 across the row. 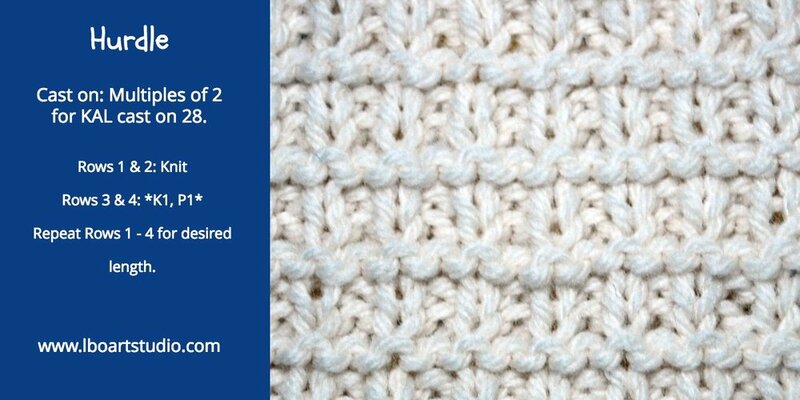 This stitch is fun to do with its easy 4 row repeat. You need to mark the front with a stitch marker otherwise you can lose track while watching Netflix. Remember the original project was to make a 49 x 63 inch afghan in wool from 7X7 inch squares. But if you want to make this for a charity like Warm Up America, they request squares/ rectangles be knit 7"x9" in acrylic or machine washable wool. 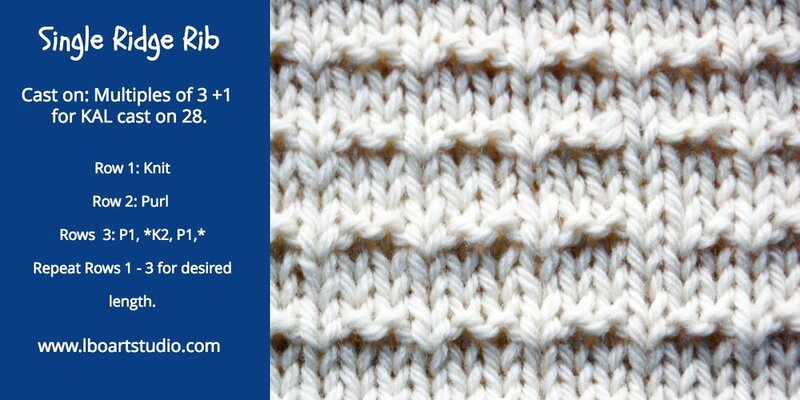 The checkerboard is another reversible stitch. I redesigned this one with an 8 stitch repeat rather than the more common 10. Why? I wanted it to fit the 4 stitch gauge for the width of out squares. I chose Cascade 220 for this project as it is an easy to obtain basic high quality wool in a large color range. One viewer mentioned the expense of wool. Well, this is true. Wool is more expensive than acrylic. Sign up for online shops like Webs and for the newsletter of your local yarn store to get notice of when certain wool yarns are on sale. You could also just use up your stash, making sure that you stay on gauge for a 7 x7 inch square. And you can set up an alert on Craigs List for yarn and trust me, many folks get into knitting and get in deep and then lose interest and want to sell or give away their stash! Worth taking a look. And don't forget to let all your friends know that you knit. I can't tell you how much yarn has come my way through friends and friends of friends.